To get started, make sure to read these IMPORTANT GENERAL INSTRUCTIONS before you begin. Another excellent resource on how to build paper models is the Card Modeling FAQ by Steve Brown. If you have any trouble or if something is wrong with the instructions, please contact me. 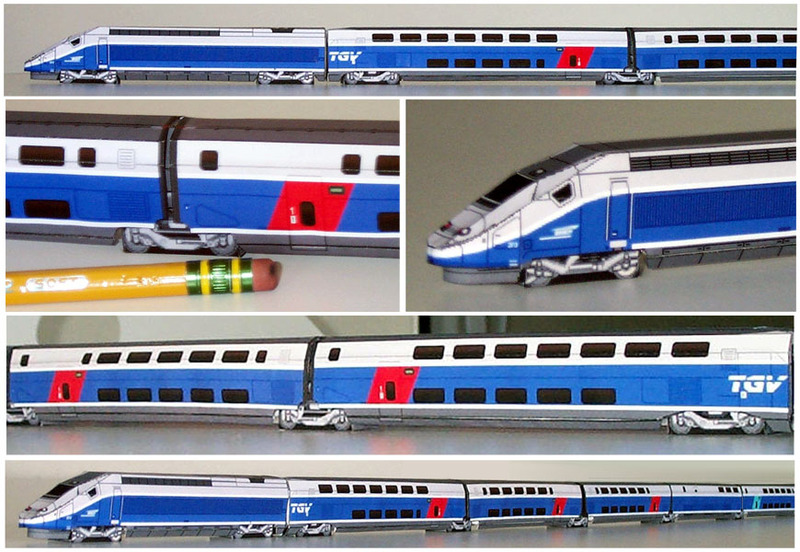 This is a complete scale model of the TGV Duplex high speed train, a bi-level trainset introduced in 1996 to serve the heavy traffic on the Paris-Lyon high speed line. Select the links below to view and print the parts sheets, making sure to read the corresponding instruction sheet before starting. Each vehicle will take you about 45 minutes to 1 hour to build. I wish to thank André Sintzoff and Tanguy Couvrat-Desvergnes for their help in getting the details right. Put your trainset together in the following order: 1 Power Car, trailers R1 to R8 oriented such that the roof power cable runs continuously along the length of the trainset, and finally the second Power Car. See TGV trainset formations for more detail. Please Send in your photos!